Our new riding event was held last Sunday in the popular holiday and fishing destination Tumby Bay, Eyre Peninsula. 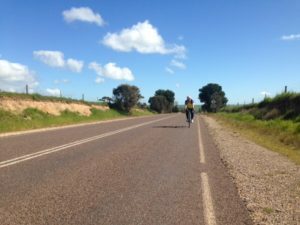 The event had two options the mini Gran Fondo – 30km and half Gran Fondo 60km. 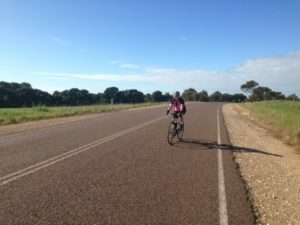 Our group started riding from the front street heading to Ungarra. The event went well and it was represented by 10 PP members plus 2 Support Crew. The ride itself was dominated by the NW head wind until reach our destination with a table full of refreshments! On the way back a tail wind helped to keep the group together and a final lead out held by Greg gave the riders a good taste of the Tour de France. Overall, it was a good day and everyone enjoyed the day out! Ungarra is a small agricultural based town located on the Eyre Peninsula, 30km from Tumby Bay and 80km from Port Lincoln. The name ‘Ungarra’ is derived from a nearby waterhole of the same name which is located just to the south of the township. It has a Mediterranean climate and receives on average just over 400mm of rainfall every year. On behalf of the PP committee, we thank everyone who was involved in ensuring that this event went smoothly for the members. Thank you for your participation and riding. 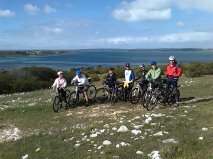 Raf lead a Mountain Bike ride to Pelican Point and back. Looked like rain at the start but it held off. Everyone really enjoyed it – including the snack and coffee! Met at Old Airport Rd. near the Coffin Bay Turn-off. The ride we usually do on Saturdays and Sundays to the end of the bitumen at Sleaford. It’s a 40km return ride. Pretty nice ride. To download a GPX file of the track click here. That’s how this ride is well known between the locals. Departing from Pt Lincoln heading to Tumby Bay, turning left in direction to Cummins through the Todd Highway. We ride in secret spots!